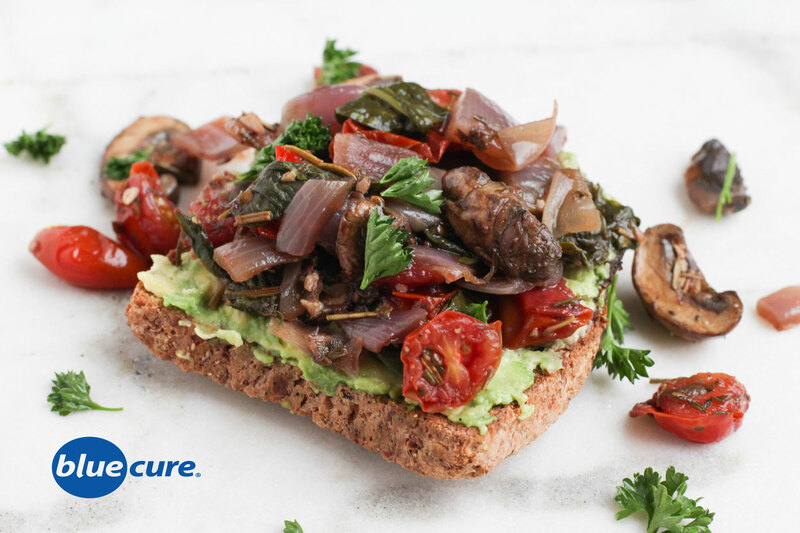 Mix up your morning breakfast routine with portobello mushrooms and avocado toast. The balsamic vinegar and the red onions and tomatoes make this dish naturally sweet, while the herbs pack in the flavor. Serve the mushroom melody warm or store some as leftovers and enjoy it cold the next day. It tastes great topped on a salad too! If using dried herbs, combine the rosemary, thyme, and balsamic vinegar in a small bowl. Set aside and let the herbs soak. Wash and prep the produce. Chop the onions and mince the garlic. Sauté on medium-high heat with 1-2 tablespoons of water, adding more water as needed to keep them from sticking. Add in the sliced mushrooms and allow to simmer on medium heat with the onions. Add in the balsamic and the herbs. Stir until well combined. Once the mushrooms are cooked, add in the tomatoes and the greens. Sauté until the greens and the tomatoes start to cook down. Toast the bread and spread on the avocado. Top off with the sautéed mushroom and veggies. Enjoy!